We quickly serve municipal, state, superior and federal courts, whether charges are related to a misdemeanor or felony case. Do you have questions about how this whole process works? Let us explain it and help you get your loved one out of jail today! We’re here for you or your loved one 24/7. We pride ourselves on keeping the amount of time spent behind bars as brief as possible. Bail Now – Pay Later! No money due for 30 days on all credit card releases by phone. For over 80 years, Sacramento Bail Bonds has been getting people out of jail quickly and affordably. Getting arrested and going to jail can be an intimidating and confusing experience, which is why the pros at Sacramento Bail Bonds will take you step by step through the bail process. 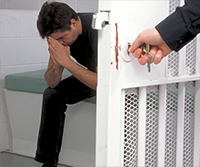 We’ll work hard to get your loved one out of jail as soon as possible. Because anyone can be arrested at any time, we have six licensed bail agents working 24 hours a day, seven days a week to assist you with your immediate bail questions and concerns. Don’t let someone you love spend a minute longer than they need to in jail; give us a call and let Sacramento Bail Bonds begin working toward his or her release.